Living in Jefferson, IN, means having historical sites around town are never in short supply. However, one thing that is much more difficult to find is a reliable landscaping company. There are numerous services in the area, but few provide the level of quality that your home deserves. Worst still is how much some of these service providers cost! When your yard needs the best protection against weeds, cold weather, and other common nuisances, there’s only one company you can trust. At Lawn Works, we remain the best in professional lawn care around! For several years now, we’ve been assisting more area homeowners with saving lots on a broad range of landscaping services. When you need better lawn care at affordable rates, you can always rely on us. Call us today for the best in local lawn care service. We achieve the results that no one else does! Our team prides ourselves on providing more ways to protect your lawn than anyone else. No matter what your yard requires to look its best, we offer it and more! And more yard care service needs! Whatever areas your yard happens to be lacking, our team is here to help you. Call us now and discover how we can best maintain your yard! Some may think that maintenance and upkeep for a yard is a manageable set of chores. However, before too long, it’s evident that they aren’t as simple as they once appeared. Something as quick as mowing the lawn soon grows tiring. But when you hire all your lawn care needs to a professional service, it saves you more time each month. Whether you can’t find a reliable company to keep your trees and bushes trained or you’re concerned about what will happen when winter comes, our professional landscaping efforts are here for you. 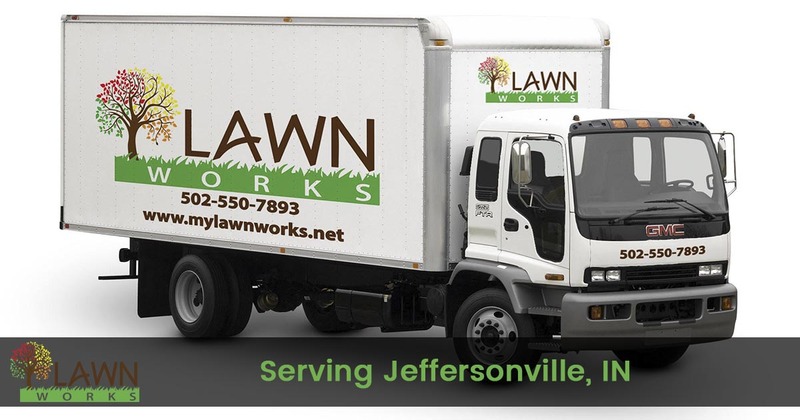 When you hire the top choice in Jefferson lawn care, you can save on better results each day. If you’ve exhausted time and money attempting to maintain your outdoor areas yourself, then it’s time to have better results with affordable lawn care. Call us now and let us support your yard with better maintenance options. If you’re ready to save more time and have reduced landscaping costs, then hiring a local yard care service is the top investment for your home. When you choose the all-in-one landscaping professionals, you can enjoy fewer issues and increased savings. Our experienced team is ready to keep your yard looking great every month. For the reliable option in professional landscaping services, you can always trust Lawn Works each time. Call our office today to discover how you can save more on a broad range of landscaping services by choosing us. We’re passionate about keeping yards green and growing for longer!